"The Nelson family gave one of their musical entertainments at the Tasmanian Inn, Pontville (now Epsom House), on Monday evening. The inhabitants of the district mustered in strong force, and were so highly delighted that a general request to repeat it will be complied with at an early period." Concerts in the Ballroom at Epsom are not advertised publicly. If you want to know about upcoming concerts you will need to get onto our mailing list – see link below. 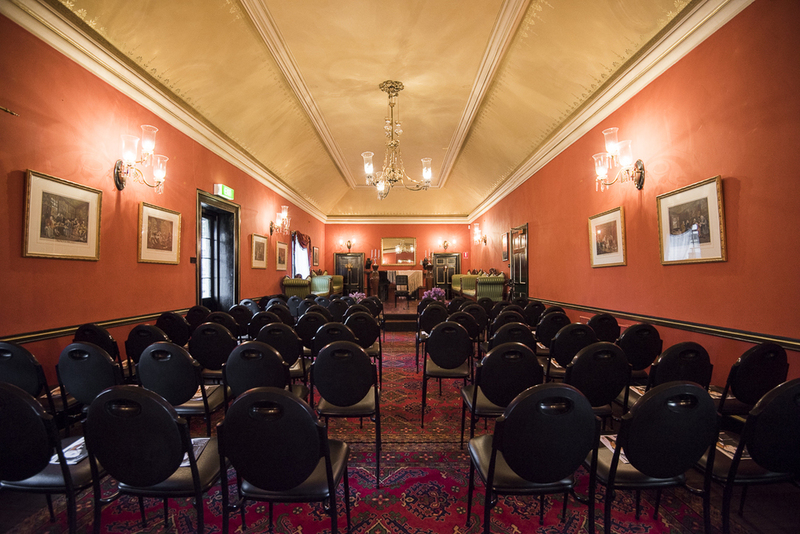 The Ballroom at Epsom has hosted some of Australia’s best classical and jazz musicians and fine international ensembles. Flautist Jane Rutter, classical guitarists the Duo Maccari-Pugliese from Italy and the Eldering Ensemble from Germany have graced the ballroom along with the Australian String Quartet, the Seraphim Trio, Ensemble Liaison, soprano Jane Edwards, the Sydney Jazz Trio, the Tony Gould Trio and many others. We have a close relationship with the Conservatorium of Music and provide performance opportunities for many emerging musicians. Concerts in the Ballroom at Epsom are an offering of Gourmet Music. They combine the ambience of an historic house with great music played by fine musicians, accompanied by delectable food prepared by our chef, Ceinwen Macbeth. We greet our guests as they arrive. Pre-concert, you can mingle with fellow guests over a glass of champagne and a platter of hors d’oeuvres. Sit in the conservatory or the flower-hung courtyard or wander in the gardens, if the weather is fine. Feel free to take a glass of wine into the performance. At interval, enjoy one of Ceinwen’s wicked desserts with your tea or coffee – or try one of our fine wines from the bar. We also offer Sunday afternoon concerts with a simpler format – but there’s still coffee and cake to die for. The ballroom is the kind of intimate space for which chamber music was originally written – Beethoven, for example, died only three years before it was built. There is no “glass curtain” between musicians and audience as there often is in large concert halls. The superb acoustic means you hear every note. Musicians love the honest sound and the connection with the audience so we have no shortage of performers.